In this lesson we learn how to use CSS to change the fonts used on our webpages. We can use CSS to modify the font and the group of font families we would like to select from. 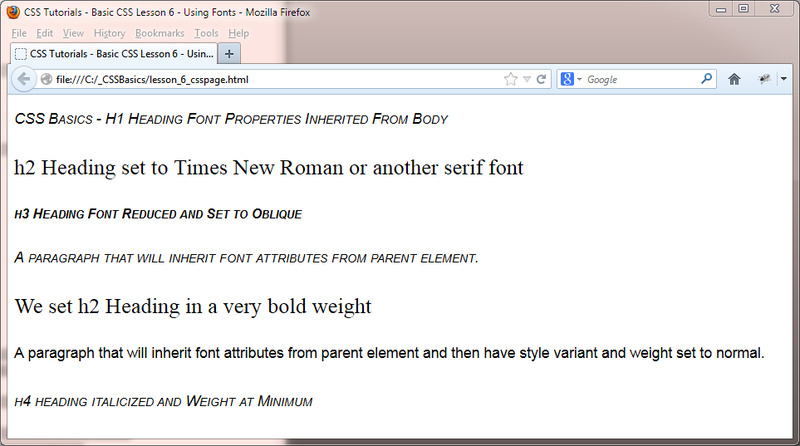 CSS also allows us to change the font size, the appearance of the font used and the weight of the font. Allows us to combine the other CSS font properties into one handy shorthand property. Specify the font for an element. Allows us to vary the size of the text on our web pages. Allows us to vary the style of the text on our web pages. Used to make text appear in small caps. Allows us to vary the weight of the text on our web pages. Lets take a look at the CSS font properties to see the visual impact they have on our text. Open up the file with Notepad we created and tested in Lesson 5: Styling Text. Save the file in the C:\_CSSBasics folder as lesson_6_csspage.html and close the Notepad. From the C:\_CSSBasics folder, double click on the saved file and it will appear in your default web browser and look something like the following image. As you can see the CSS font properties really give us a lot of control over the way our text is presented. The font CSS property condenses our CSS and makes it more readable. Inheritance allows us to set a font for a parent element, knowing that all child elements will inherit the font characteristics we set in the parent, unless we choose to override them. Although graphics and animations look great its the textual content on our pages that really make our websites stand out from the crowd. Spend time mastering the properties for fonts and it will really pay dividends in the long run. Play around with the file in this lesson to really get a feel for the various properties we used and how inheritance effects styles lower down the cascade. In the next lesson we take a delve into the CSS box model and get to grips with the margin and padding dimensions used by the box model.